KajSQL: Rhymes with (and is about) MySQL: The Query Analyzer -- a potential Killer App? 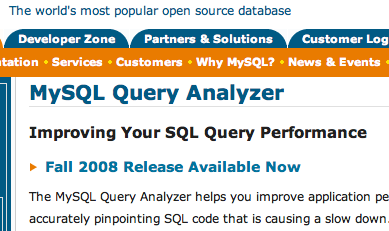 There have been plenty of blog entries and writings about the MySQL Query Analyzer, for what I think are good reasons. Labeling it a potential Killer App, causing many MySQL users to become paying Sun customers, may be a daring thing. However, the Query Analyzer might very well have what it takes. The key benefit of it is that it identifies the source of performance bottlenecks. In that sense, one could perhaps instead call it a profiler, as it analyses the set of all queries going on, as opposed to an individual one. One person to whom I described it said "ah, so it's sort of a DTrace for MySQL queries?" -- and for those who know what DTrace is, it's not a bad analogy. Some of the key documents and blogs to read includes the overall product description, the Sun PR text, and the interview with Mark Matthews. Do read Mark Callaghan's review "Query Analyzer Rocks". Do read Zack Urlocker's Query Analyzer related business model discussion, where he asks "Can you develop a business model that works for the community and for paying customers?". Given the non-FOSS nature of the Query Analyzer, there has also been some community discussion on this, such as Baron Schwartz mentioning an alternative to the MySQL Query Analyzer, followed by Mark Leith's response to it. And the non-FOSS nature of the Query Analyzer is something I need to underline, in order not to set false expectations. It is part of the MySQL Enterprise subscription offering. It is not GPL software. So what this means is that you will be confronted with registrations, with trial periods and similar things familiar from other non-FOSS software, should you decide to try it out. You may agree or disagree as to whether that is right or wrong, but that is the business model we've chosen at Sun Microsystems (and read Zack's blog post for some of the underlying reasoning). And while my role as VP MySQL Community is primarily focused at growing and serving the MySQL user base, I am of course also interested in Sun having a business model for MySQL that enables growth in economic terms. I'm excited to see where the Query Analyzer will take us! So, to sum it up: You may recall various discussions on Sun wanting to serve both the group of people who "have more time than money" and those who "have more money than time". The value of MySQL Query Analyzer just might be compelling enough for many to count themselves into the latter group. I think the query analyser is a good offering. Everybody will have something to like and dislike about it, but I think that both the design and the business decisions around it are within the realm of sane (from my perspective) and thus I applaude it as a good step by Sun/MySQL. Question though: what's going to happen with the "enterprise binaries"? Is that going to continue with 5.1 ?